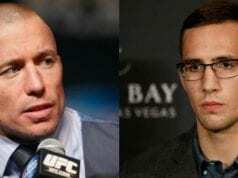 The UFC once relied heavily on their welterweight champion and Canadian national hero Georges St-Pierre. ‘Rush’ came up through the golden era of the division’s history, seeing off some of the greatest names in the promotion’s history during his nearly ten-year stint in the promotion. St-Pierre won the title twice through his illustrious career, and his second reign was six years long. He eventually gave up the belt in late 2013 after a controversial UFC 167 split decision win over Johny Hendricks, amidst a torrid storm of media, the effects of which are still being felt today. 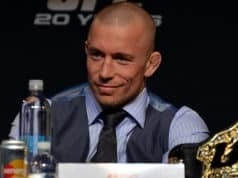 Clearly the game he once ruled so dominantly had become a tax on the Tristar UFC champion, and it is beginning to look like we’ll never see him step in the octagon again. 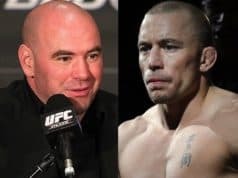 We’ve grown used to seeing legends of MMA simply fall from the pinnacle and never recover, but there’s something about GSP’s semi-retirement that just leaves a big gap, too many unanswered questions maybe? Perhaps calling it quits before the inevitable decline was for the best, but opposite to that, the hanging up of the gloves is considerably easier to accept when the speed and power start to fade.